Hellen van Rees is a designer who colors outside the lines. 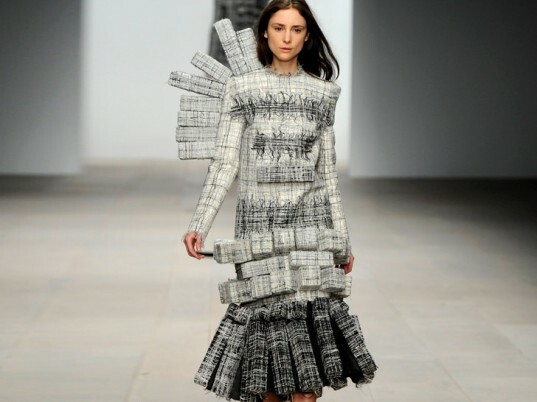 The London-based designer, who is pursuing a master's degree in womenswear from Central Saint Martins, recycles scrap yarn into Chanel-inspired wearable sculptures. Decked in three-dimensionally woven cubes, van Rees's "Square One: The Miracle of the Space Age" collection borrows cues from the French maison's signature tweeds, the ramrod silhouettes of 1920s flappers, and Anish Kapoor and Rachel Whitebread's 3D artwork. Van Rees creates each textile herself using both remnant thread from a nearby knitting factory and repurposed fabrics she teases apart for yarn. Her process involves little cutting or sewing. Instead, van Rees weaves each fiber directly into the desired shape. “I don’t have to weave a square and then cut my pattern pieces,” she tells Ecouterre. “I can weave in the shape of the garment.” The resulting pieces are completely seamless, leaving no production-floor waste behind. The extruding blocks turn traditional ladies’ suiting into “something more subversive and architectural,” she says. “I think the impact is much more powerful because it’s a clash of something very rich and traditional with something modern and crazy,” van Rees adds. Often, the cubes are attached to pleats, creating a fluidity of movement in an otherwise static configuration. Keep this one in your sights. Van Rees creates each textile herself using both remnant thread from a nearby knitting factory and repurposed fabrics she teases apart for yarn. Her process involves little cutting or sewing. Instead, van Rees weaves each fiber directly into the desired shape. "I don’t have to weave a square and then cut my pattern pieces," she tells Ecouterre. "I can weave in the shape of the garment." The resulting pieces are completely seamless, leaving no production-floor waste behind. 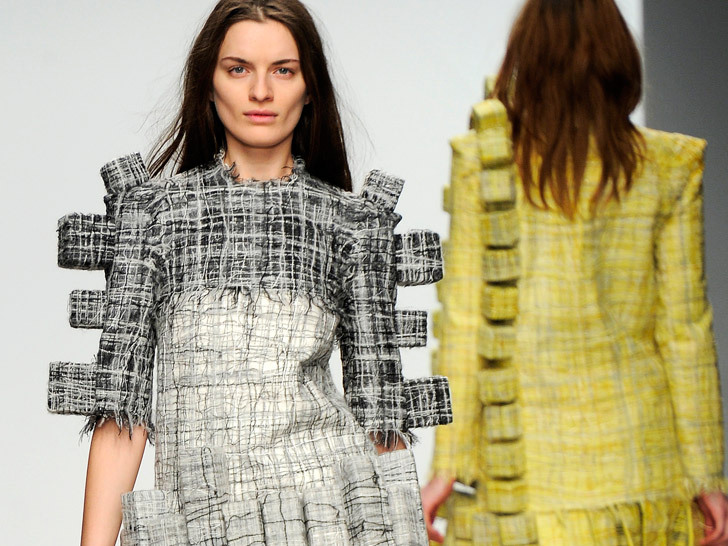 The extruding blocks turn traditional ladies' suiting into "something more subversive and architectural," she says. "I think the impact is much more powerful because it’s a clash of something very rich and traditional with something modern and crazy," van Rees adds.